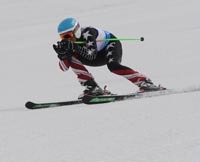 Katelyn Rathfon of the Sun Valley Ski Education Foundation and Scott McGrath from the Summit Ski Team of Park City, Utah earned overall titles at the end of the four-day U-14 (ages 12-13) Tri-Divisional Alpine Ski Championships that ended Sunday on Baldy. Rathfon, 13, won Sunday’s super giant slalom on Warm Springs by .68 seconds to go with her second-place finishes out of 84 girls in Friday’s giant slalom and Thursday’s slalom. McGrath, 13, placed second in Thursday’s giant slalom, then won Friday’s slalom in an 85-racer field and was 13th in Sunday’s super giant slalom. Other podium finishers from the SVSEF in the U-14 age class were Jake Blackburn third place in giant slalom, and Sage Rheinschild third places in slalom and super giant slalom. In all, 19 SVSEF racers competed in the field of 170 racers from the Intermountain and Northern Divisions, and Alaska. - U-14 girls: Katelyn Rathfon 2-SL (2nd overall), 2-GS (2nd overall), 1-SG (1st overall); Sage Rheinschild 3-SL (3rd overall), 6-GS (6th overall), 3-SG (3rd overall); Libby Kaiser 13-SL, 18-GS, 16-SG; Ella Viesturs DSQ-SL, 10-GS (11th overall), 20-SG; Molly Milgard DNF-SL, 17-GS, 8-SG (8th overall); Libby Lindstrom 33-SL, 43-GS, 59-SG; Bailey Holter 47-SL, 49-GS, 44-SG; Riley Revallier 48-SL, 48-GS, 53-SG; Pilar Pennell DSQ-SL, 52-GS, 32-SG. - U-14 boys: Jake Blackburn 3-GS (4th overall), DNF-SL, 5-SG (5th overall); Noah Leininger 8-GS (12th overall), DSQ-SL, 13-SG; Charlie Stumph 13-GS, DNF-SL, 44-SG; Cooper Dart DNF-GS, DNF-SL, 6-SG (6th overall); Keegan Webber 27-GS, 21-SL, 54-SG; Matt O’Connor 31-GS, 19-SL, 43-SG; Ethan Daves 49-GS, 38-SL, 62-SG; Mac Mizer DNF-GS, DNF-SL, 46-SG. ( U-16 boys: John Blackburn 1-GS (3rd overall), DNF-SL, 3-SG (16th overall); Wyatt Smith 2-SL (12th overall), 5-SG.